Woodlands and Meadows: Compost: Part I - Why do my Gardens Look so Good. Compost: Part I - Why do my Gardens Look so Good. Yes I am bragging, I don't do that very often, I really am very modest. But June is when my gardens shine. Everybody's garden shines in June. Spring rains (extra this year), warm temperatures, the bugs haven't chewed everything yet, no mildew, but there is another secret. There is nothing better you can do for your plants than improve your soil before you put them in. ﻿Absolutly nothing. Many people ask how I get my plants to look so good. The single word I answer is ... Compost. Compost is more of a soil conditioner than a fertilizer. 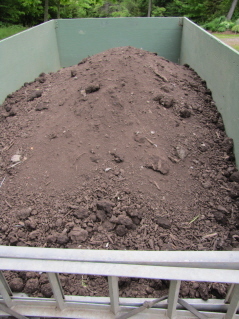 The fertilizer of any compost is quite low. But what it does is conditions the soil to allow that soil to either release the nutrients it already has (clay) or allow the soil to hold nutrients (sandy). It gives clay soil structure, aeration and allows it to drain and allows sandy soils to retain water, nutrients and gives it structure. 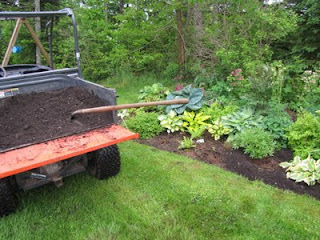 ﻿ I also like to top dress with compost. 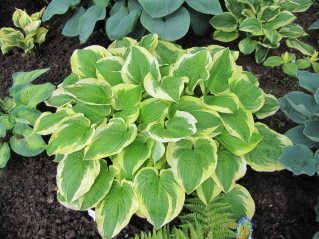 It gives a nice clean look as well as adding extra compost to the soil. It helps to keep the weeds down (more on that later), the soil moist (not a problem this year) and just gives a very finished look to it. I usually add about 2" every year. This is my compost pile in the back of the veggie garden. This is two years old and has been turned probably 3 times. It would have been originally, 3X the size. I use this for my vegetable garden (more on that later too). A few weeds are turning up in it but nothing too bad (no perennial weeds). It is not as fine as it would be if you bought a bag at the store. I don't mind seeing the odd egg shell or unbroken down piece of plant material. 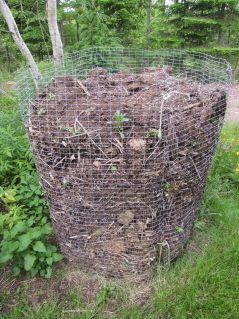 If it is too big I toss it into this years new compost bin and let it go through another years cycle. This is this years new pile started late last summer with garden clippings, chopped leaves, kitchen waste (peelings, paper towel, newspaper, coffee/tea), and bunny cage waste (bunny poop/newspaper). I don't have a method for properly building a compost pile (you can find all sorts of recipes on the Internet). I don't have time, I just dump and I figure it gets mixed enough when it gets turned. 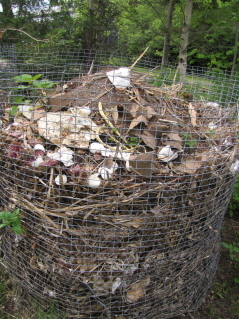 Home composting usually doesn't allow the compost to get up to a temperature to properly kill all the weed seed or pathogens. Pathogens is not a problem in mine because I don't add questionable materials. I also don't add weeds. They get thrown in the woods. I did say that compost will keep down weeds. It will help suppress those weeds that are present in your soil as long as they are not perennial weeds that grow by underground rhizomes (sheep sorrel, crab grass, buttercup, dandelions - when the root was not completely removed)﻿. But weeds being weeds, there are always some seed being blown in or very persistent ones coming through, compost does make them easier to pull since the soil is loose. 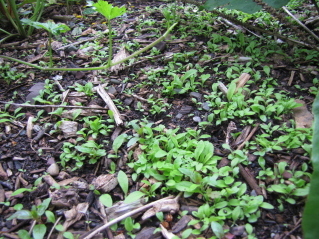 Weeds can come in with the compost though, which can create a whole other problem. 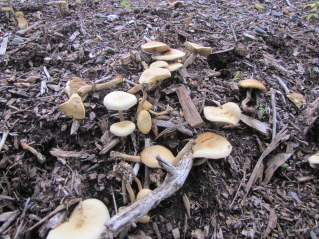 It can even bring in other organisms such as mushroom and maybe even unwanted insects such as earwigs. So where do you get your compost is the next most common question. The next blog will explain. I'll give you the pros and cons of 3 different sources that I tried this spring and which one I went back to.